Released on occasion of the Cafe’s 70th Anniversary. A great ride through the first Ace Cafe Reunion, held in September 1994. The event reinforced the cultural importance of the Ace Cafe. Many motorcyclists and rock n` roll heroes cut their teeth at the Ace Cafe, going on to win on the racetrack, start bands or open clubs. The film features interviews with original patrons and those that came from far and wide to enjoy the day. 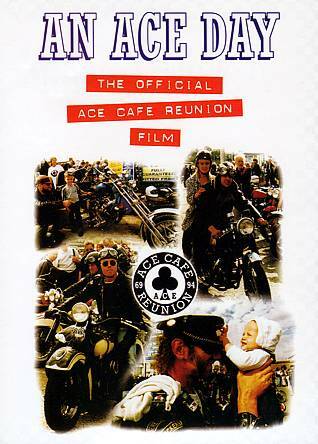 This film is a record of the 1994 Ace Cafe Reunion, when 12,000 people and 7,000 bikes gathered to participate in this memorable occasion. It has been widely acclaimed and includes interviews with the original patrons and subsequent generations of motorcylists. Set to a rock n` roll soundtrack…..it`s a piece of history!